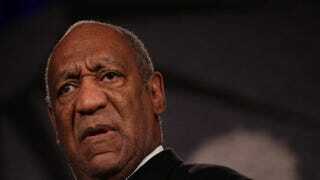 Comedian Bill Cosby speaks at the 20th anniversary of the Rev. Al Sharpton’s organization National Action Network on April 6, 2011, in New York City. Bill Cosby came under fire during his early professional years for not addressing race in his comedy routines. Journalist Mark Whitaker reveals in his new book, Cosby: His Life and Times, how the entertainer refused to label himself a black comedian, but he spent the bulk of his career fighting for civil rights and racial equality through his work, activism and philanthropy. After reflecting on Cosby’s personal story in part 1 of an interview with The Root Editor-in-Chief Henry Louis Gates Jr., here, in part 2, Whitaker explores the social impact of Cosby’s years in show business. Henry Louis Gates Jr.: Mark, there was a time when Bill Cosby was the most popular television star in America, probably the world. And certainly everyone considers him one of the game changers of television for The Cosby Show, Thursday nights, eight seasons. What’s his perspective on the impact that the show had? Mark Whitaker: I think that when white folks think of Bill Cosby, they think of someone who not only made them laugh but also helped white America become comfortable with black America. And I think that’s true, going back to his comedy albums, I Spy, his work on children’s television, his commercials, even before The Cosby Show, and then absolutely with The Cosby Show. I think he sort of tried to help them see that black folks are just like white folks, what people have in common—friendship with I Spy, and interactions with kids with the commercials, and love of these kinds of commercial products, and then family life with The Cosby Show. And I think Cosby was aware of that and I think feels proud of that and does view that as part of his legacy. MW: The fact is, he always had an agenda, and he had a variety of reasons for not wanting to bring it into his humor or to be subtle about the way in which he brought it into his TV shows. But the fact is, privately, in terms of his own activism and his own philanthropy and his commitment to hiring blacks and opening doors for blacks, he was always a race man. HLG: I agree with you; there is no question that Cosby is a race man. And in fact, I thought that the most important contribution that Bill Cosby did, the most important contribution Bill Cosby has made to the status of African Americans, was through his comedy albums and particularly the first one, Bill Cosby Is a Very Funny Fellow … Right!, the first one that I ever heard, because even at the age—that came out in what year? MW: In the fall of 1963. HLG: OK, I had just turned 13 years old and my older brother was 18, and he played that album, and even at that age, I realized that having a black man just tell jokes about the human condition—not the black human condition—about what the writer Frances Ellen Watkins Harper in 1861 called “feelings that are general.” She admonished black writers, the first year of the Civil War, they had to start writing about being human, not just being black. HLG: That, for Bill Cosby—just to be able to do that so successfully and have millions of people thinking about Noah, the story of Noah, in an entirely new way, through a black voice, but never talking about being black—was revolutionary. And I think that is his most revolutionary contribution to racial politics in America, ironically: precisely by not being “black.” And I think it was an act of genius. HLG: How did he understand that, Mark? That is, to me, the hallmark of Cosby’s genius. Think about the timing; juxtapose what was happening in the world in August 1963—the greatest civil rights march in history. And here, September, this album comes out, so precisely against the grain; Cosby makes this genius, sui generis intervention. How—I mean, where in the world did this come from? MW: Well, first of all, I write about that juxtaposition, and I think it sort of inspired him. But it was also a time when the country badly needed to or was looking for someone like him, in a sense. The fact that [Martin Luther King Jr.] would talk about black folks being judged by the content of their character and not the color of their skin, and then Cosby comes along and basically has people laughing at the content of his. I think the country badly needed [it], not just after King’s speech but everything that had happened in 1963 in Birmingham, [Ala.,] and the killings and so forth. I think it was really the moment for him. Here’s what I would say about how he thought about it. At the time or shortly after that, he gave interviews in which he articulated it, but I think for Cosby then—and I think this has always been the case—it was as much an instinctive process as a kind of intellectual process. HLG: Dr. King was assassinated, of course, in 1968, and a sort of transformation takes place with Cosby. Can you talk about that a bit? MW: He was about to go onstage in Kansas, at the University of Kansas, to give a performance, and I guess he saw or heard a bulletin that King had been shot. And he tried to go back and perform his second show, but he couldn’t do it, and about 15 minutes in, he just said to the audience, “I’m sorry, I just can’t go on. Excuse me.” And there was a standing ovation, although he felt it was for King and not for him. And he immediately canceled the rest of his concerts that week and flew first to Memphis[, Tenn.,] because [his friend Harry] Belafonte and Sidney Poitier were going to march with the garbage workers in Memphis in memory [of] and solidarity with King, because, of course, that was why he was in Memphis when he was shot. And then went from there to the funeral in Atlanta. HLG: So in 2004, Cosby was invited to an anniversary celebration of Brown v. Board, and rather than entertain the crowd—though I found it quite intellectually entertaining—Cosby goes off on the black underclass—sagging pants, fatherless children, piercings, Ebonics. Some people felt it to be a full-blown rant, but in the aftermath, conservatives were lining up to support him, but also he took a lot of criticism from African Americans, who accused him of scapegoating. What caused that critique, and how do you think he feels about it now? MW: I think that—and as you know, there was a lot of debate, and Michael Eric Dyson wrote a book in which he kind of … suggested that this was sort of a well-thought-out critique on Cosby’s part. The fact is, it wasn’t. I make that very clear in the book. … What he was thinking was, the whole point of Brown v. Board was to open access to black folks to the same education that white folks got. And Cosby felt, and he had felt for a while, that rather than embracing those opportunities, there were—not all blacks, but a lot of blacks—were kind of like, this idea had been developed, that somehow, getting a good education was acting white. There had been a lot of self-segregation, black folks sort of cutting themselves off, even at places like Harvard and Yale, now that they could go there. He had been sort of egged on over the years in this line of thinking by his friendship with Kenneth Clark, who was a major figure in the Brown v. Board process with the doll study and the way that that was used by [Thurgood] Marshall and the lawyers in arguing the case. And Ken Clark had become very close to the Cosbys. After his wife, Mamie, died, actually, he would spend weeks and weeks visiting them in Massachusetts. He and Cosby would have these long, late-night conversations about their frustrations with the lack of progress in race relations, which they both blamed—both, to some degree—on the persistence of white racism. They were not at all blind to that. But also, their feeling that black folks were kind of … embracing and relishing this self-image as victim, the sort of victimology, rather than … embracing a creed of empowerment and responsibility. So as Cosby’s listening to all of these tributes, he’s thinking about Kenneth Clark, who was—he was ill with cancer at that point, couldn’t attend the event. And just getting worked up, just more and more worked up. And he’s got the stage, and then he just went off. And the fact is that it wasn’t—I don’t think he had planned it; I don’t think he knew exactly what he was going to say. But you’ve got to remember, this was a guy who—he makes his living by standing up in front of audiences and kind of improvising and saying funny things. But it just—I think, once he got going, he just couldn’t stop. I think he originally wanted to make a point more about parenting than about black youth. Because if you actually go back and you listen and read the speech, he starts by talking about honoring the generation of Marshall and the civil rights pioneers, and about squandering the opportunities that they had created, and about the need for parents to tell their children how important education is. But then he just, he just went off, and before you know it, he’s talking about the kids themselves—the way they dress and the way they talk—in a way that … what had originally [been] planned as just a couple of minutes onstage becomes 20 minutes. And everybody there was completely stunned. He actually got a lot of laughs, because there were some funny lines in there, but people just didn’t know what to make of it. I think that the organizers of the event were chagrined, partly because they felt like—even if they agreed with some of what he was saying about responsibility—they felt like he was just blaming it on black folks and folks in the inner city and so forth. HLG: What does he consider his greatest achievement? MW: Well, it’s very simple, but I think he takes tremendous pleasure—which is why he’s still out there performing all the time—in making people laugh. And when he talks about laughter, he uses the word “release.” He says it gives them “release.” And I think this goes back to your first question. I think this goes back to his own childhood … with all of the pain and the loneliness that he felt in his early childhood, and all the tension that was in his home because of his father’s drinking, and because of financial problems and because of his brother’s illness … his brother died eventually of rheumatic fever when he was 7 … or about to turn 7. I think laughter was a release for him, from that pain and that sadness. And I think he feels that a lot of people go through life with a lot of sadness, a lot of pain, a lot of pressure, a lot of stress, and then, if you can just make them laugh, it gives them a release from that. So it starts with that. I think, on a day-to-day level, that he views that as his greatest accomplishment. And then … on a broader level, I think he would probably say helping people see that they have more in common than they have differences.